Nearly 100 days into the Trump presidency, some college administrators are still fearful that their college’s tax-exempt status may be in jeopardy because of students’ political signs. That was the case at the University of South Alabama last week when student David Meredith put a “Trump/Pence 2016” sign in his dormitory window, months after Trump took office. As FIRE detailed in our letter to the university, administrators ultimately charged Meredith for violating orders to remove the sign, notwithstanding his objection that the First Amendment protected its display. The university has, wisely, since dropped the charges. 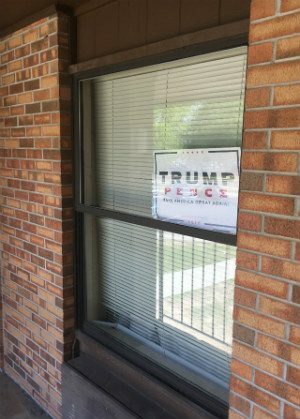 The day after Meredith posted his “Trump/Pence 2016” sign, he received an email from the community director, an administrator who oversees several dormitory buildings at the university. The administrator told Meredith that displaying “political signs” in windows was “against university policy” and that the Trump sign would have to be removed within 24 hours. Instead of backing down, the community director sparred with Meredith over email, arguing that the dorm was a “federal building” that could not show support for candidates. As Meredith pointed out in the exchange, this would mean that federal buildings couldn’t display the name of the president — and a state university’s dorm is not a federal building. This is not to mention that the campaign ended almost five months before Meredith’s sign went up. However, all of this was irrelevant. Political speech is protected not only during campaign season, but after the campaign is over. Moreover, as we pointed out in our letter to the University of South Alabama earlier this week (embedded below), 501(c)(3) tax-exempt status in no way requires universities to censor students’ political speech. Rather, 501(c)(3) status, at most, requires tax-exempt entities to avoid reasonable appearances that the institution itself is endorsing a particular candidate. Under [the university’s] application of the 501(c)(3) policy, a student may display a political sign only where nobody can see it. No person, however unreasonable, could be misled into believing that the University of South Alabama had chosen to make its endorsement, in an election for the highest office in the land, through a solitary sign placed in one of dozens of windows in one of thirty-two dormitory buildings. That the university furnishes living areas to students, at the students’ expense, does not render students’ speech that of the university. A contrary interpretation, untenable at a university of any caliber, would require administrators to police and censor nearly every political expression on campus. [The city] has almost completely foreclosed a venerable means of communication that is both unique and important. It has totally foreclosed that medium to political, religious, or personal messages. Signs that react to a local happening or express a view on a controversial issue both reflect and animate change in the life of a community. Often placed on lawns or in windows, residential signs play an important part in political campaigns, during which they are displayed to signal the resident’s support for particular candidates, parties, or causes. [Footnote.] They may not afford the same opportunities for conveying complex ideas as do other media, but residential signs have long been an important and distinct medium of expression. Displaying a sign from one’s own residence often carries a message quite distinct from placing the same sign someplace else, or conveying the same text or picture by other means. Precisely because of their location, such signs provide information about the identity of the “speaker.” As an early and eminent student of rhetoric observed, the identity of the speaker is an important component of many attempts to persuade. [Footnote.] A sign advocating “Peace in the Gulf” in the front lawn of a retired general or decorated war veteran may provoke a different reaction than the same sign in a 10-year-old child’s bedroom window or the same message on a bumper sticker of a passing automobile. An espousal of socialism may carry different implications when displayed on the grounds of a stately mansion than when pasted on a factory wall or an ambulatory sandwich board. Residential signs are an unusually cheap and convenient form of communication. Especially for persons of modest means or limited mobility, a yard or window sign may have no practical substitute. Thankfully, the university quickly backed down, and Meredith — and students of all political stripes — can continue showing support for candidates of their choice. Of course, none of this would have happened if the university had a 501(c)(3) policy that unambiguously indicated that student political speech is unlikely to be construed as that of the university, and that administrators should consult with university counsel before attempting to enforce the policy. The University of South Alabama’s policy at least indicates that student organizations may engage in some partisan activity, but remains vague on whether, or how, individual speech may cause the university to “support or appear to support candidates” for office. The kindest explanation for [vague 501(c)(3) policies] is that they reflect a strong desire to stay well away from even the remote possibility of endangering the university’s tax-exempt status. In other instances, the invocation of Section 501(c)(3) has seemed much more like a pretext for censoring unpopular speech than a risk-avoidance measure. In either case, it is clear that unnecessary censorship in varying forms, scope, and application will continue to plague college campuses under the guise of Section 501(c)(3) compliance until institutions are pressured to place a higher value on student political discourse in practice, not just in word. A wise university will take this opportunity, before campaign season starts up again, to rethink how its 501(c)(3) policy might look to an administrator left to their own devices. Students whose speech is threatened by 501(c)(3) policies are invited to get in touch with FIRE.